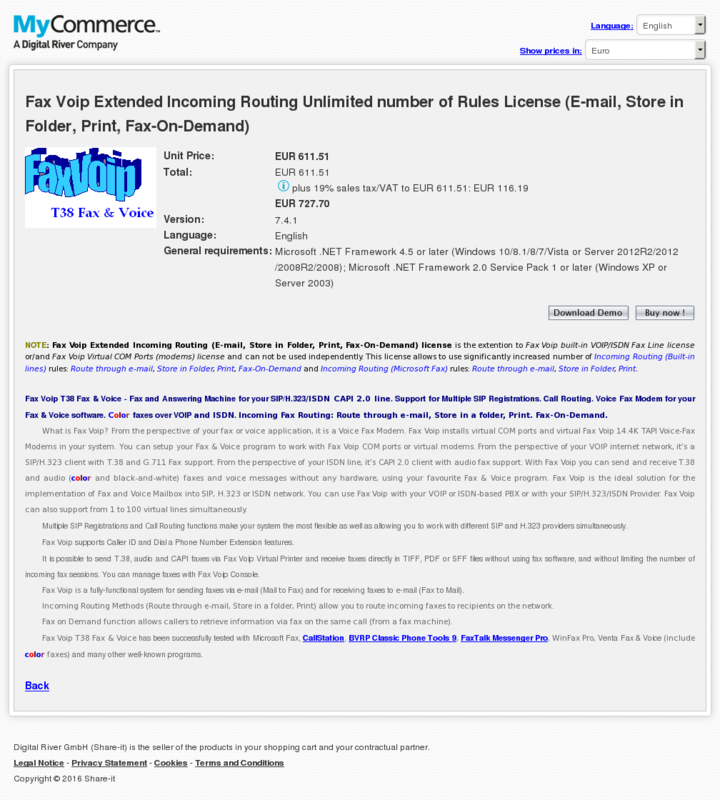 NOTE: Fax Voip Extended Incoming Routing (E-mail, Store in Folder, Print, Fax-On-Demand) license is the extention to Fax Voip built-in VOIP/ISDN Fax Line license or/and Fax Voip Virtual COM Ports (modems) license and can not be used independently. This license allows to use significantly increased number of Incoming Routing (Built-in lines) rules: Route through e-mail, Store in Folder, Print, Fax-On-Demand and Incoming Routing (Microsoft Fax) rules: Route through e-mail, Store in Folder, Print. Fax Voip T38 Fax & Voice – Fax and Answering Machine for your SIP/H.323/ISDN CAPI 2.0 line. Support for Multiple SIP Registrations. Call Routing. Voice Fax Modem for your Fax & Voice software. Color faxes over VOIP and ISDN. Incoming Fax Routing: Route through e-mail, Store in a folder, Print. Fax-On-Demand. What is Fax Voip? From the perspective of your fax or voice application, it is a Voice Fax Modem. Fax Voip installs virtual COM ports and virtual Fax Voip 14.4K TAPI Voice-Fax Modems in your system. You can setup your Fax & Voice program to work with Fax Voip COM ports or virtual modems. From the perspective of your VOIP internet network, it’s a SIP/H.323 client with T.38 and G.711 Fax support. From the perspective of your ISDN line, it’s CAPI 2.0 client with audio fax support. With Fax Voip you can send and receive T.38 and audio (color and black-and-white) faxes and voice messages without any hardware, using your favourite Fax & Voice program. Fax Voip is the ideal solution for the implementation of Fax and Voice Mailbox into SIP, H.323 or ISDN network. You can use Fax Voip with your VOIP or ISDN-based PBX or with your SIP/H.323/ISDN Provider. Fax Voip can also support from 1 to 100 virtual lines simultaneously. It is possible to send T.38, audio and CAPI faxes via Fax Voip Virtual Printer and receive faxes directly in TIFF, PDF or SFF files without using fax software, and without limiting the number of incoming fax sessions. You can manage faxes with Fax Voip Console. Fax Voip T38 Fax & Voice has been successfully tested with Microsoft Fax, CallStation, BVRP Classic Phone Tools 9, FaxTalk Messenger Pro, WinFax Pro, Venta Fax & Voice (include color faxes) and many other well-known programs.